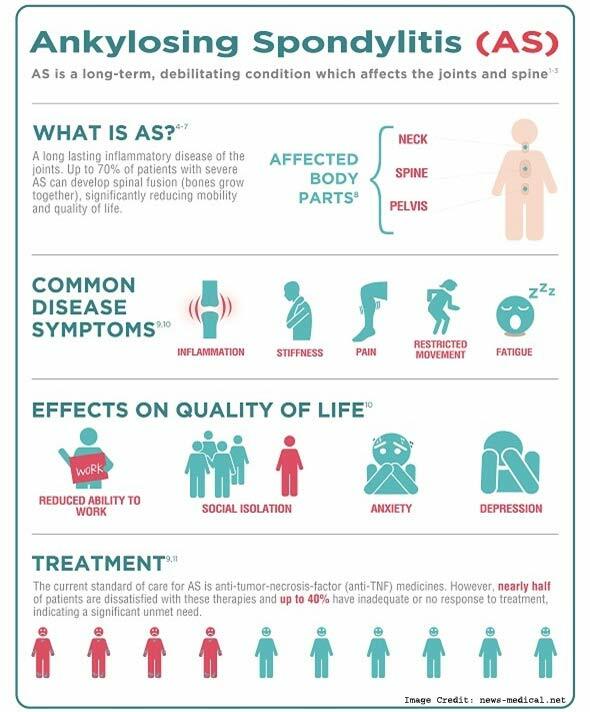 Ankylosing Spondylitis (AS) is defined as an inflammatory disease that can cause some of the vertebrae in the spine to fuse. The disease is just one of many kinds of arthritis and although some other joints in the body can be affected, it usually involves the spine. 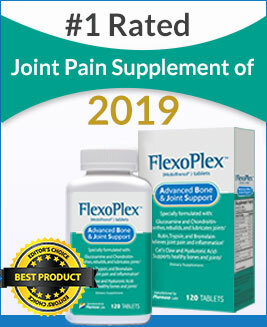 AS causes inflammation of spinal joints or vertebrae that can lead to severe, chronic pain and discomfort, thus affecting a patient’s overall quality of life. In the most advanced cases of the disease, the inflammation leads to formation of the new bone by fusing vertebrae, as mentioned already. Spine fuses in a fixed, immobile position and usually creates a forward-stooped posture called kyphosis. Keep on reading and discover more interesting information on ankylosing spondylitis. In some instances, the disease affects eyes (uveitis or iritis) as well as heart and lungs. One of the most distinguished features of AS is the involvement of the sacroiliac joints during the progression of the condition. The sacroiliac joint is the joint between the sacrum and the ilium bones of the pelvis, which are connected by strong ligaments. The primary role of this joint is to connect spine and pelvis. Historical background and origin of some disease are always subjected to numerous debates among scientists primarily because diagnoses and labels change over time. Ankylosing Spondylitis is a disease with a long history considering that Egyptian pharaohs also had it. Radiological examinations of Amenhotep II, Ramses II the Great and his son Mereptah showed that among pharaohs of the 18th and 19th dynasty there were at least three rulers with AS. During Middle Ages, a group from Bristol examined 560 adult skeletons, with at least part of the vertebral column intact, whose remains were gathered from different churches and cemeteries including the bones of 7 Saxon bishops interred in Wells Cathedral. More than a half of the examined skeletons had a certain degree of spinal osteophytosis, but only two cases of spondyloarthritis were identified. Although the disease appears in the relatively small sample, compared to the amount of examined skeletons, the finding does demonstrate the presence of this disease in medieval times. Although Ankylosing Spondylitis has been around for centuries, the first sighting of skeleton affected by the disease occurred in Italy. Realdo de Colombo (an Italian professor of anatomy) started his prolific career as an assistant to Andreas Vesalius (physician, author, founder of modern anatomy). Later, de Colombo became Professor of Anatomy at the University of Padua, one of the oldest institutions in Europe founded in 1222. During the 16th century, the time of renaissance in Italy, Realdo de Colombo wrote anatomical descriptions of two skeletons characteristic for Ankylosing Spondylitis. The anatomical descriptions were published in his book De Re Anatomica. Realdo de Colombo’s descriptions of the Ankylosing Spondylitis-affected skeleton was a solid foundation for all other discoveries that occurred decades and centuries later. In 1695-5, Irish physician and historian Bernard Connor provided the first definite description of this disease. He described a skeleton found in a French churchyard or charnel house. The skeleton’s vertebrae and ribs were so straightly and intimately joined, their ligaments perfectly bony, and their articulations so effaced, that they comprise one uniform continuous bone. Connor also deduced that the person whose skeleton he examined must have experienced difficulty walking or turning and could have abnormal abdominal and diaphragmatic breathing. In the 18th century, three students discovered a human skeleton with similar abnormalities like Connor described. Their findings were immediately published by their professor Johann Sebastian Albrecht (physician and naturalist) in 1748. Several skeletons affected by Ankylosing Spondylitis come from London in the 19th century, starting with Sir Benjamin Brodie (English physiologist and surgeon who pioneered research into bone and joint disease) who described, in 1850, a case of a man whose disease started when he was 27, becoming entirely rigid in just six years. A man had long continued rheumatism of the spine with a hoop-like deformity and occasionally suffered from inflammation in his eyes. This poses as the first reported case of uveitis in combination with AS. In 1858, William Sturge (physician and archaeologist) gave a detailed description of a 26-year-old man with a fixed spine and chest. The disease started when he was only 18 years old and included symptoms such as urethritis, back pain, and iritis. Moreover, in 1877, Charles Fagge (a British surgeon) provided the first correlation of clinical and pathological findings. He described a 34-year-old man experiencing cough, a rigid curved spine, fixity of the ribs, and breathing primarily with his abdomen. In 1892, a neurologist Vladimir Bechterew described three patients: a mother, daughter, and a man, all suffered some trauma to the back. He concluded that a chronic process occurring in the vertebrae and develops independently leads to ankylosis. It is highly likely that the process leads to a diffuse or chronic inflammation of the epidural connective tissue. Despite the fact that Bechterew favored a neurological approach to the disease, the observation of both a mother and a daughter dealing with AS suggested the genetic predisposition in certain individuals. Five years later, in 1897, Adolph Str?mpell (a neurologist), described cases of two patients with complete ankyloses of the spine and both hip joints. He discovered that lumbar lordosis in a rigid spine was a prominent feature and published photos of those patients. Adolph Str?mpell recommended that the disease should be described in more descriptive terms like a chronic inflammation of joints in the vertebral column, without focusing on neurological features, which was in Bechterew’s case. Pierre Marie (a French neurologist) was the one who provided the most detailed clinical description of Ankylosing Spondylitis and coined the term spondylose rhizomélique or Ankylosing Spondylitis. In 1935, Charles Buckley described Ankylosing Spondylitis as an infection of low virulence acting for prolonged period and sensitizing some tissues. The American surgeon, Charles W. Hufnagel, discovered the association between this disease and heart issues in 1956. It took a lot of time, examinations, descriptions, and reports for Ankylosing Spondylitis to be considered and investigated as a separate disease. The discovery of HLA-B27 in 1973 played the pivotal role here. HLA-B27, the human leukocyte antigen, was first discovered by scientists in Britain. The global prevalence of this inflammatory disease is believed to range between 0.1% and 1.4%, but it is difficult to be certain since data on this subject is largely limited. The disease exhibits higher prevalence among individuals of lower socioeconomic status, who are more likely to experience poor functional outcomes than their counterparts with more privileged socioeconomic status. Ankylosing Spondylitis is more widespread in Europe and Asia than in North or South America. For instance, the estimated number of AS cases spreads from 1.30 to 1.56 million in Europe and 4.63 to 4.98 million in Asia. The prevalence of this disease in the United States is between 0.2% and 0.5%, depending on the population studied. According to some estimates, about 129 out of 100,000 people in the United States have Ankylosing Spondylitis which is about 350,879 individuals in the country. The exact cause of this disease is unknown, but as already mentioned above, genetics play a major role in its development. A vast majority of people with AS also have a gene that produces a genetic marker, an above-mentioned protein HLA-B27. In North American Caucasians, the gene is found in 7% of the healthy population and in more than 90% of patients with Ankylosing Spondylitis. In fact, a person who is positive to HLA-B27 has between 5% and 6% chance of developing this inflammatory disease unhealthy fats, highly processed foods, sweets. About a third of the overall genetic risk accounts for the presence of this gene. That said, it is important to bear in mind that presence of this particular gene marker doesn’t, automatically, indicate a person will develop AS. Although multiple studies have confirmed the link between Ankylosing Spondylitis and the HLA-B27 gene marker, it’s not quite clear why it causes this disease. What scientists do know is that the natural function of the gene marker is to bind and present intracellular antigenic peptides for cell surface presentation to Cytotoxic T lymphocytes (CTL), lymphocytes that kill other cells. The HLA-B27 gene may cause the disease by presenting arthritogenic peptides to pathogenic T cells. Another postulate is that this particular gene marker causes AS due to the fact it has abnormal cell biology. So, if the presence of this gene causes AS, then why are some people positive to HLA-B27, but they don’t develop the disease? Scientists assume that there might be two types of B27; one type carries the risk while the second type doesn’t. At this point, that remains a theory subjected to the scientific studies. Furthermore, although B27 is essential for development or inheritance of this disease, its penetrance is vastly modified by other genes in the body. In addition to this gene marker, there is a small number of genes with moderate effect and a large number of genes with small effect, all contributing to the disease. In fact, for a long period of time, scientists believed that AS was a monogenic condition, due to its strong relationship with HLA-B27, but recent studies proved otherwise and discovered that other genes play a certain role as well. Besides strong relationship with a genetic marker, current evidence suggests that Ankylosing Spondylitis is triggered by exposure to a common environmental pathogen. Since the condition has a worldwide prevalence, the environmental trigger that contributes to its onset occurs from Africa to Asia. The primary reason why scientists believe the environmental pathogens do play a role is because epidemics of AS have never been reported, unlike reactive arthritis, yet another condition associated with B27. 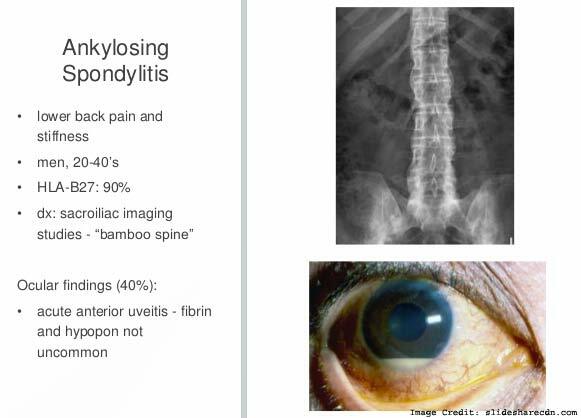 It is speculated that environmental factor involved in Ankylosing Spondylitis is ubiquitous. This theory is supported by studies of B27-transgenic rats which reveal that the disease develops in rats exposed to normal enteric commensal bacteria, but not in animals maintained under germ-free conditions. Environmental factors play the greater role in the timing of Ankylosing Spondylitis onset and may have a bigger influence than genetic factors. That said, genetic factor is more important in influencing prognosis of the disease. Since both the environment and genetics play a role in the development of AS, carrying out more studies on this topic is essential to learn more about different aspects of the disease. Gastrointestinal infections – gut infections from bacteria such as shigella, salmonella, and campylobacter enhance the odds of AS, particularly if you have genes that make you susceptible. Despite the fact it’s not clear why gastrointestinal infections are linked to this disease, it’s highly likely due to the way one’s immune system reacts to bacteria. Furthermore, the infection could trigger the disease if it causes intestines to break down, thus allowing the bacteria to enter the bloodstream in the sacroiliac joints area. Unlike other types of arthritis which occur at an older age (the risk gets higher the older you are), people usually develop Ankylosing Spondylitis between the ages of 17 and 45. The mean age of developing the condition is 23. That said, in some instances AS can affect children and those who are much older, as well. Unexplained pain in heels, joints, and chest – since AS develops at a younger age, experiencing pain in the above-mentioned regions is always a reason for concern since it’s not typical for younger individuals to experience these symptoms for no apparent reason. In some cases, a patient doesn’t experience back pain first but symptoms of AS begin with pain or discomfort in the heel or joints of the wrists, ankles, etc. Besides prevalence, gender differences are also pronounced in pain location. For example, men usually experience pain in the spine and lower back while women are more prone to pain and discomfort in neck, knees, and hips. Since back pain is the most obvious sign of AS, men are more likely to receive an accurate diagnosis, while it’s not uncommon for women to get inaccurate information. Also, women are less likely than men to experience severe pain, they usually experience mild to moderate intensity of symptoms, which is why the disease is sometimes misdiagnosed for fibromyalgia. It is of extreme importance to see the doctor when experiencing pain in lower back and other and make sure you inform a healthcare provider about every symptom you notice in order to receive a correct diagnosis. 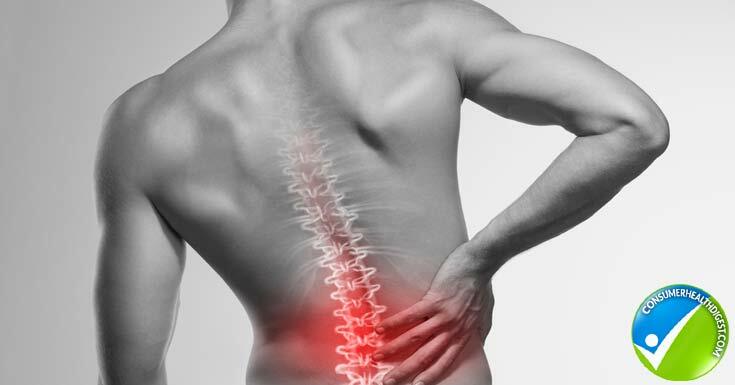 As mentioned above, it is highly significant to schedule an appointment and see your doctor if back or joint pain persist or aggravate after periods of inactivity, especially if these symptoms occur in younger individuals and are accompanied by fever, lack of appetite, and so on. During the appointment, the doctor asks a patient about symptoms he/she experiences, severity, when they first occurred, family history and so on. Then, the healthcare provider performs a physical exam. Here, the physician might ask a patient to bend in different directions in a bid to evaluate the range of motion in the spine. The doctor may decide to reproduce the pain by forming a pressure onto specific portions of the pelvis or by moving the legs in a specific position. Another thing the doctor may do during the physical exam is to ask a patient to take a deep breath in order to examine whether a person experiences difficulty expanding the chest. 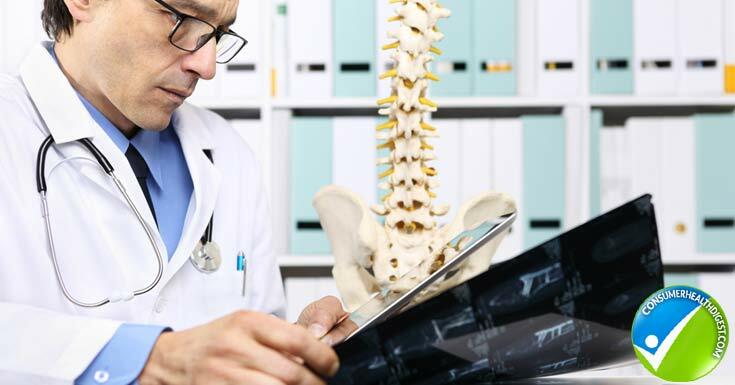 Since symptoms of Ankylosing Spondylitis are quite similar to many other health conditions, the doctor has to do some tests in order to make an accurate diagnosis moderate intensity of symptoms. The healthcare provider usually orders an x-ray to look for signs in the pelvis and spine. A common feature associated with AS that is clearly visible during this diagnostic test is deformed vertebral bodies that have taken an abnormal square shape i.e. bamboo spine appearance. On x-ray, this gives the spine a segmented and symmetrical appearance. A vast majority of x-ray findings are seen around the sacroiliac joint, usually on both sides. Although x-ray allows physicians to check for changes in joints and bones, in most cases visible signs of AS aren’t evident in early stages of the disease, but when it starts progressing. A magnetic resonance imaging or MRI utilizes strong magnetic field and radio waves to provide more detailed scans of soft tissues and bones. Unlike x-rays, MRI can spot and reveal signs of Ankylosing Spondylitis when the disease is in its early stages. That said, this diagnostic test is more expensive than x-ray scans. A urine test is often recommended in instances when the doctor wants to observe whether a patient also experiences abnormalities of the kidney or when he/she wants to rule out kidney conditions that could lead to back pain. This is yet another laboratory test recommended in cases when doctors want to make sure their diagnosis is correct. Some blood tests check for markers of inflammation or the doctor will order a blood test to check whether you’re positive to HLA-B27. 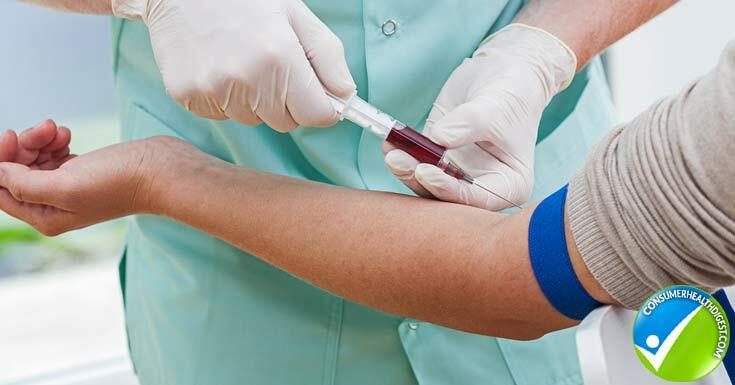 To rule out other diseases, when performing diagnostic tests, patients are simultaneously evaluated for signs and symptoms of psoriatic arthritis, venereal disease, dysentery, inflammatory bowel disease, and so on. Men are more likely to develop Ankylosing Spondylitis, as mentioned above, and unlike other diseases affecting joints, this one doesn’t usually develop in older stages of life. Young men affected by AS wonder how it is going to impact their health or how to cope with their condition. Facing the reality can be too much for some men which is why it’s not uncommon to feel depressed as well. Acknowledging that negative feelings are linked to depression is a healthy move while ignoring the mood and emotional changes can develop unhealthy lifestyle habits and only aggravate the disease. Since the disease strikes when you’re younger and can coincide with plans to start a family, it is not uncommon to wonder whether it could affect the fertility as well. Some medications used to treat symptoms of Ankylosing Spondylitis can have a negative effect on your fertility. According to some reports, the sulfasalazine drug (Azulfidine) prescribed to treat pain and swelling, can lower sperm count while cyclophosphamide (Cytoxan) is also believed to affect fertility. That said, scientists discovered that TNF-? inhibitors don’t have a negative effect on sperm quality even under long-term treatment. Men diagnosed with Ankylosing Spondylitis should see their doctor regularly, adhere to the treatment, and learn how to manage the disease since they are twice as likely as women to have a risk of severe joint damage. Although AS is usually referred to as a “man’s disease” it also occurs in women. Just like it was already mentioned, ladies have a relatively milder form of the disease and it progresses more slowly than it does in men. Besides physical implications, the disease can make an affected woman feel anxious, sad, or scared as symptoms start to interfere with day to day life. Women with AS have almost an equal chance of having their disease improve, worsen, or remain unchanged during pregnancy. If the disease was active at the beginning of the pregnancy, the chances are higher it will flare up shortly after childbirth. While the disease won’t harm the baby, it can make the delivery more difficult. It is advised that pregnant women with AS consult their doctor regarding medications they take. One of the most common complications of Ankylosing Spondylitis is uveitis, a form of eye inflammation affecting the uvea (the middle layer of tissue in the eye wall). Uveitis causes rapid-onset eye pain, blurred vision, and sensitivity to light. About 30% patients with AS also experience uveitis but it’s not fully understood why it occurs. What scientists do know is that the immune response associated with AS that develops spinal problems is similar to the inflammation observed in uveitis. The level of antistreptolysin O (ASO) was found to be significantly higher in AS patients with uveitis than those without, thus suggesting that the infection of hemolytic streptococcus is related to uveitis in Ankylosing Spondylitis. At this point, it is still unclear whether the streptococcal infection is the primary cause of uveitis in AS by directly or indirectly triggering the inflammation or a patient who is sensitive to streptococcal infection is predisposed to uveitis. Part of the body’s attempt to heal in cases of severe AS is fusion or formation of the new bone. The newly-formed bone bridges the gap between the vertebrae and becomes inflexible and stiff. Since the fusion stiffens the rib cage, a patient with Ankylosing Spondylitis experiences reduced lung capacity and function. As a result, it becomes more difficult to take deep breaths. Some patients also develop scarring or fibrosis at the top of the lungs, thus making it harder to ward off viruses and infections. It is crucial for individuals with AS to avoid smoking! As a patient gets older the severity of inflammation in the lungs increases. Inflammation associated with the disease can spread to the heart and aorta, as well. As a result of inflammation, the aorta can become distorted and enlarged, thus impairing the heart’s ability to function adequately. The outcome isn’t too difficult to guess, people with Ankylosing Spondylitis have a higher risk of cardiovascular disease which can, potentially, lead to heart attack, stroke, angina, aortic valve disease, etc. About 10% of patients with AS experience cardiac issues, but even more shocking is the fact that the disease increases heart disease or stroke risk by 25% to 60%, especially for people 20 to 39 years old. Why does AS lead to heart damage? Answers to this question can be numerous, but it’s most likely because the same inflammation that causes joint pain is responsible for the higher heart disease risks. However, it’s important to bear in mind that heart disease risk isn’t limited to Ankylosing Spondylitis only; a vast majority of rheumatic diseases are linked with higher odds of cardiovascular diseases. Although the inflammation is the primary culprit for higher risk of heart diseases in patients with AS, other factors play a role as well. For example, some medications used to manage the condition such as NSAIDs are well-known for the heart disease risk. The best way to avoid heart attack and other unwanted consequences is to manage the disease as recommended by the doctor and to lead a healthy lifestyle. During the early stages of the disease, some people’s bones start thinning. Weakened vertebrae can damage, crumble, or break easily, thus increasing the severity of stooped posture. Fractures in vertebrae may damage both spinal cord and nerves attached to it. This complication is somewhat paradoxical since the disease process is characterized by the proliferation of the bone and although the bone amount is increasing, it still becomes weak. Additionally, up to half of all individuals affected by Ankylosing Spondylitis also have osteoporosis, thus making the fracture risk even higher. Speaking of bones and skeletal system, it is also important to mention that some patients with AS also experience joint inflammation which can make chewing more difficult. Luckily, unlike other kinds of arthritis, Ankylosing Spondylitis doesn’t affect fingers. The condition doesn’t have physical implications only but affects emotional health of an individual at the same time. It can be difficult, especially for younger patients, to cope with the disease since it’s something they’ll have to manage throughout their lives. Depression is quite prevalent in Ankylosing Spondylitis patients affecting 80% women and 50% men. Chronic inflammation and frequent pain are the main factors that lead to depression, but fortunately, it’s entirely possible to manage and overcome symptoms of depression. In fact, managing depression can also help relieve symptoms of Ankylosing Spondylitis as depressive thoughts aggravate the severity of the chronic pain inflammation and frequent pain . Surgery – in most cases, AS doesn’t require surgery, but the doctor may recommend it if other forms of treatment prove to be ineffective in relieving severe pain. Also, in instances with severe joint damage, the doctor might suggest surgery to replace damaged joints. Visit the ULTIMATE CM CREAM Review: It might help to deal with mild to moderate pain and aches. Think positive – there’s no cure for AS, but it doesn’t mean it’s the end of the world for you, there’s no chance you’ll accomplish anything, happiness is far away etc. Thinking positive is crucial, with some lifestyle changes and listening to doctor’s recommendations, one can successfully manage the disease and improve quality of life. Ankylosing Spondylitis is a type of arthritis indicated primarily by back pain but many other symptoms occur as well. Although the disease has no cure, it’s possible to manage it effectively. The underlying reason that leads to Ankolosing Spondylitis is still unknown. Consult a doctor if symptoms mentioned in this post persist. And, remember, the manifestations of ankylosing spondylitis can be kept under control with the right measures.